Serious infectious diseases – once eliminated from the United States – have come back to make our children sick; some can cause permanent disability or death. Since January, there have been 228 people infected with measles across 12 states. This month, Arkansas saw a new outbreak of mumps that was serious enough to prompt school officials to close the DeQueen schools. Arkansas has had a 470 percent increase in the number of whooping cough cases since 2011, according to the Arkansas Department of Health. Why is this happening? These diseases are all preventable if children receive vaccines at the recommended time. However, not enough children are being vaccinated against these illnesses to provide community immunity or “herd immunity.” The percentage of children under the age of 2 years who have received no vaccinations has quadrupled in the past 17 years, the Centers for Disease Control and Prevention reports. That’s about 100,000 children who are not vaccinated against 14 potentially serious illnesses. Viruses come into the United States from unvaccinated travelers or from people traveling here from countries that still have these diseases. When the viruses are brought here, most people already have an immunity against them. The problem is, a growing number of parents are refusing or delaying their children’s vaccinations. When the herd immunity drops, outbreaks of measles, mumps and other diseases begin to reoccur. That’s what’s happening now. Vaccines are safe. What is not safe is failing to be vaccinated. Vaccines protect the person getting the vaccine and protect everyone else by reducing their chances of coming in contact (and getting sick from) a virus or other germs. Vaccines work by pushing our immune systems to increase the body’s natural ability to find and kill disease-causing germs. The body “remembers” how to fight those illnesses when we encounter them again. The “remembering” is called immunity. Developing a vaccine is a tedious, multiyear process with duplicate safety tests at every step. Before a vaccine is available, medical experts evaluate the test results and all vaccine information to determine both safety and effectiveness. As new research becomes available, vaccine recommendations are updated or revised. In the very rare case that someone has a bad reaction from a vaccine, most cases completely resolve on their own, without medical attention. Vaccines protect us all. My vaccine helps protect you; your vaccine helps protect the kid next door. Because we all breathe the same air, our individual immunity depends on the immunity of everyone we encounter. When one of us is sick with a communicable disease or a cold or flu, it increases everyone’s risk of getting sick. Vaccines also protect those who cannot be vaccinated because they are too young, pregnant, have a weak immune system or are undergoing medical treatment that prevents them from getting a vaccine. It’s easy to take vaccines for granted. There’s no way to know how many times you would have been sick or hospitalized had you not had vaccinations. However, a recent report from the National Institutes of Health (NIH) says vaccines will prevent about 322 million illnesses, 21 million hospitalizations and 732,000 deaths among U.S. children born in the last 20 years. This is a total cost savings of $1.38 trillion. The measles vaccine is 97 percent effective with two doses. Smallpox and polio have been eliminated from the United States because the vaccines were effective, and most people were vaccinated. In fact, we no longer get vaccines against the once-deadly smallpox because it has been eliminated worldwide. Failing to vaccinate can cause long-term vulnerability to other diseases. Children who get a measles infection are at greater risk for other potentially deadly infections. Children who survive a measles infection are at risk for up to three years after having had measles. Even more dangerous, a measles infection seems to be able to destroy immunity that children gain from other vaccines. While a healthy child’s immune system can rebuild itself, the child is still vulnerable to many illnesses during those two to three years. Researchers believe a measles infection wipes out the memory cells of a child’s immune system. This leaves the body without the ability to fight off all the germs it encounters in daily life. The child is at a greater risk of getting pneumonia, encephalitis and other infectious diseases. Thus, a measles vaccine helps prevent more deaths than can be attributed to measles alone. When researchers analyzed data from before and after mass measles vaccinations in Denmark, England, Wales and the United States, they found about a 50 percent drop in childhood death rates after mass vaccinations. In undeveloped countries, measles vaccination reduces the childhood death rate by 30 to 50 percent. In the poorest countries it reduces it by 90 percent. People who oppose vaccinations or don’t trust their safety – often called “anti-vaxxers” – have yet to provide scientific proof of any harm caused by vaccinations. They promote misinformation about the potential side effects of vaccines but ignore the serious, potentially deadly impact that vaccine-preventable infections can have on a child’s long-term health. There are several myths surrounding childhood vaccinations. The mistaken belief that the measles-mumps-rubella (German measles) (MMR) vaccine causes autism came from an article published in 1998. The article was later retracted when the journal found that the researcher made up the study results, lied about the clinical records and then created a single measles vaccine so his “research” would benefit him financially. The doctor’s medical license was revoked. No other studies have been able to repeat or verify the results of his study. Additionally, more than 100 studies have shown no link between vaccines and autism. In fact, new research published in the Annals of Internal Medicine says children who received the MMR vaccine were seven percent less likely to develop autism compared to unvaccinated children. Another myth is that having multiple vaccines at one time can overwhelm a child’s immune system. This myth ignores the fact that the human immune system constantly fights thousands of germs every day. It is fully capable of fighting multiple germs and building immunity to them. Extensive research and testing were done to ensure a safe and effective vaccine schedule. By waiting too long to get a child vaccinated, parents can risk their child’s health. There is a “best” time to get vaccines to provide the most protection. Timing is especially important for pertussis (whooping cough) vaccine because infants have a higher death rate from this infection. The myth that vaccines include substances that are toxic to humans is also untrue. The substances most frequently questioned by anti-vaxxers are thimerosal (mercury), aluminum and formaldehyde. In 1999, thimerosal was removed from all vaccines in response to popular but scientifically unproven fears, according to the NIH. Aluminum in vaccines creates a better immune response. The amount in a vaccine is 1/100th of the safe daily consumption. As for formaldehyde, it is a natural substance found in many plants, animals and the human body. The amount of formaldehyde that naturally occurs in the body is 100 times more than the amount in a vaccine. One-on-one contact with an informed, caring and concerned pediatrician is the most effective way to understand your child’s vaccination needs and the impact on long-term health. If you have questions or concerns about your child’s vaccinations, talk with a medical professional who can provide the facts. Afterall, if you trust the doctor to care for your child’s health, there’s no reason not to trust him or her about vaccines. Nearly all children can be safely vaccinated. The exceptions are children with an allergy to some part of the vaccine, a weakened immune system due to an illness, or medical treatment such as chemotherapy. Most health insurance policies cover the full cost of vaccines as a preventive service. If your child has ARKids First insurance through Medicaid, it will pay for all vaccines. 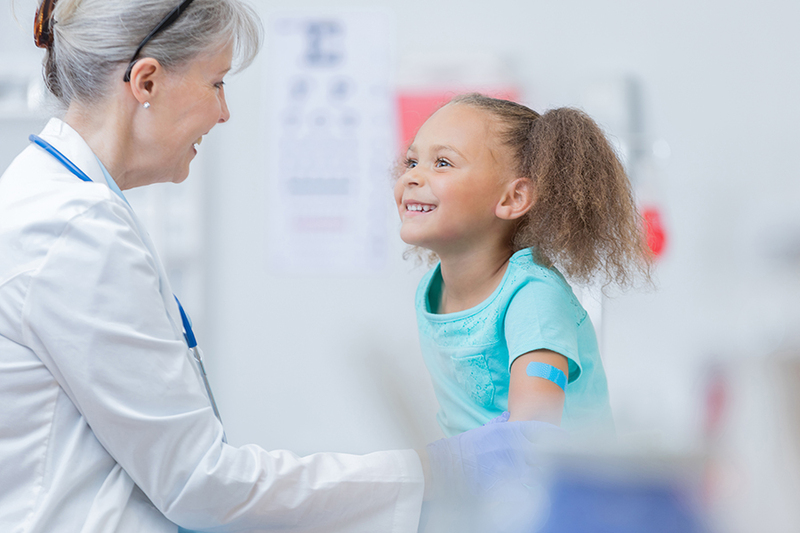 If your child does not have insurance, or the insurance doesn’t cover vaccines, the federally funded Vaccines for Children (VFC) program provides free vaccines for eligible children. Vaccines are available from your doctor, pharmacies and Arkansas Department of Health county offices. Be sure to take your insurance or Medicaid card. If you need free shots, call ahead to find out if they offer the VFC program. Even if you must pay for vaccines, they cost far less than if you get sick. Paying for illness can include medications, hospitalizations, insurance co-pays and other health costs; plus, time away from work or school. Measles can cause pneumonia, seizures, encephalitis (brain inflammation) and death in 0.2 percent of cases. Mumps can cause testicular inflammation, ovarian inflammation, pancreatitis (stomach inflammation), meningitis (brain and spinal cord inflammation), encephalitis, deafness and sometimes death. Rubella can cause arthritis, bleeding disorders and encephalitis. If a pregnant woman gets rubella, it can lead to spontaneous abortion, neonatal death and congenital rubella syndrome. Diphtheria can cause myocarditis (heart inflammation), neuritis (nerve inflammation), paralysis of the diaphragm, and death in 5 to 20 percent of cases. Polio can cause meningitis, paralysis, and 2 to 5 percent of children will die. Post-Polio Syndrome causes pain, fatigue and weakness that develops in 25 to 40 percent of people who have survived a polio infection. Tetanus can cause muscle spasms and death in 11 percent of cases. Chicken pox is associated with meningitis, encephalitis, pneumonia, skin infections and sometimes death. Shingles is a complication of a natural chicken pox infection. Shingles is less common in people who have had a chicken pox vaccine. Whooping cough can cause pneumonia, seizures, encephalitis and death in 0.2 percent of cases. Flu can cause hearing impairment, nervous system problems and death in 2 to 5 percent of cases. Natural immunity is short-lived for some diseases. It’s possible to get chicken pox more than once after a natural infection. Whooping cough’s natural immunity lasts only four to 20 years. Liver problems (cirrhosis, liver failure and liver cancer) can also develop after hepatitis B infections. The NIH says the risk of having a bad reaction to a vaccine is one in a million. The risk of a vaccine-preventable infection is one in 100 to 1,000, depending on the disease. Those are the facts. Why would a parent accept that level of risk for their child? Vaccines are safe, effective and save lives. The typical unvaccinated child is a white male, lives in a home with more than four children, his mother is married and has a college education and the family is financially stable. Failure to vaccine rates are twice as high in rural areas (2.5%, compared to 1.3% in urban areas) and much higher for children without health insurance. About 7 percent of children without insurance were not vaccinated, compared to 1 percent of those covered by Medicaid and .8 percent of privately insurance children. Poverty and race are also factors in whether a child is fully vaccinated. Non-Hispanic black children and those living in poverty are most likely to not receive all recommended vaccines. It’s the law in most states, including Arkansas, that children must be vaccinated before they’re allowed to attend any school or daycare. However, in all but three states, parents/guardians can opt out of required school immunizations for nonmedical, religious or philosophical reasons. After Arkansas allowed philosophical exemptions to vaccination, the rate of overall exemptions increased 23 percent per year, on average. The exemption rate nationwide has increased for the past three years. In some areas of the country, more than 5 percent of school-age children have been granted non-medical, personal-reason exemptions from required vaccinations, according to a study published in the New England Journal of Medicine. This failure leaves them far more susceptible to disease and poses health risks for their communities and nationwide. The American Medical Association and the Infectious Disease Society of America believe all nonmedical exemptions for childhood vaccines should be eliminated.